The Sherman Museum is a non-profit 501(c)(3) educational organization devoted to collecting, preserving and interpreting objects of historical significance for citizens of Grayson County and the Greater North Texas Region. For more information about The Sherman Museum, visit us on the web at www.theshermanmuseum.org. The Museum was built with funding from the Carnegie Foundation in 1914 as a Library. There are only a few of these “Carnegie Library Buildings” remaining in Texas. The building was designated as a Texas Historical Landmark in 1986. In 1990, the Carnegie building was placed on the National Registry of Historic Places. The museum currently has 50,000-plus objects in their collections. Museum staff are currently involved with the computerization of the collection and have completed over 14,000 documents, 9,000 historic photographs and 800 books. 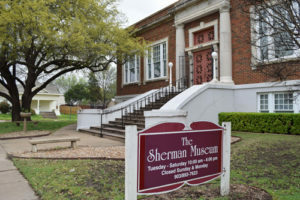 The museum is located in the central downtown district of Sherman Texas.